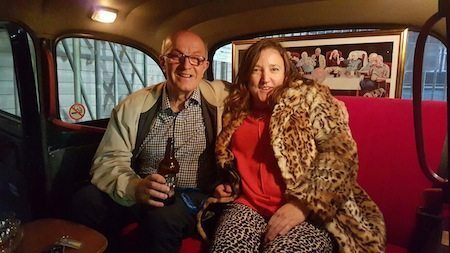 Local legend and chief geezer, Ray Gipson is on tour in the Roman Road tomorrow, Saturday 19th March, with artist Lucy Schofield, telling tales of the pubs that used to be and the community life they sustained. What really went on in the Hand and Flower? Who played in the White Horse? Whatever happened to Eddie Coffer? Book your space … there will be one trip only…first come, first served. The tour starts at 4.00 pm. 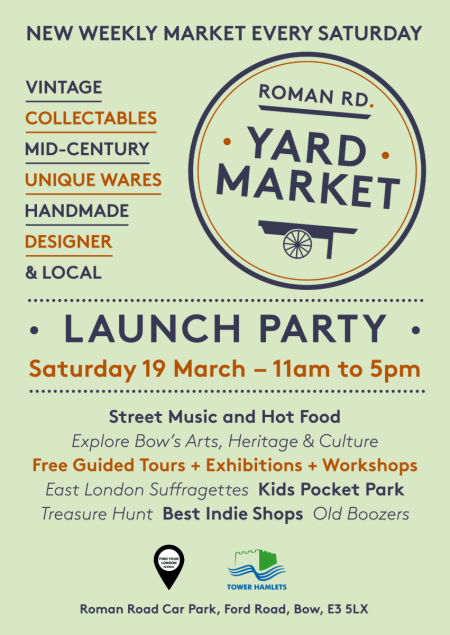 Find Lucy ‘s black cab and stall in the new Roman Road Yard Market. In the car park where the the Roman meets St Stephen’s road. You’ll also be able to buy prototype Geezer Power Products from the stall. The Saturday market is a pilot project of the Roman Road Trust . Starting this Saturday it will run over the Summer months. The market will be called Roman Road Yard Market and it will specialise in unique wares including vintage, collectables, mid-century and music, as well as locally produced or handmade arts, crafts and fashion. The new Yard Market won’t be selling fresh produce as there are plans to develop this into the main street market. The Roman Road Trust is a community development organisation working on the regeneration of Roman Road. The main aim of the market is to increase footfall to the road and profits from the new market will be reinvested into further community projects.